Cornwall is full of amazing, intriguing and unique places to visit. Sometimes it’s hard to know where to start! The Minack Theatre in Cornwall has long been on my bucket list of things to do and we happened upon a perfect day to visit. 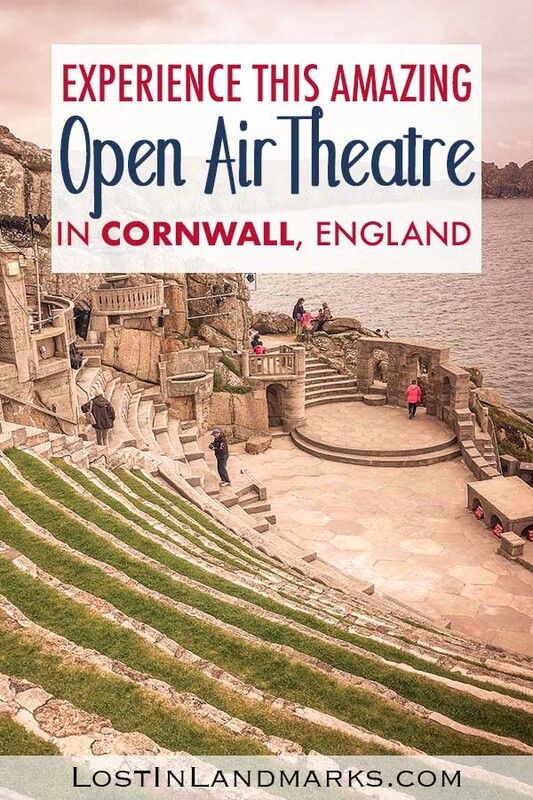 An open air theatre like this one requires a nice day to get the best of it, but really, if you’re in the area do take a look at it, because it’s an amazing bit of English quirky history with a great story about how it was built. Minack Theatre is at Porthcurno village at the very South West of England, in Cornwall. It’s almost as far as you can go with Land’s End being only 5 miles away. 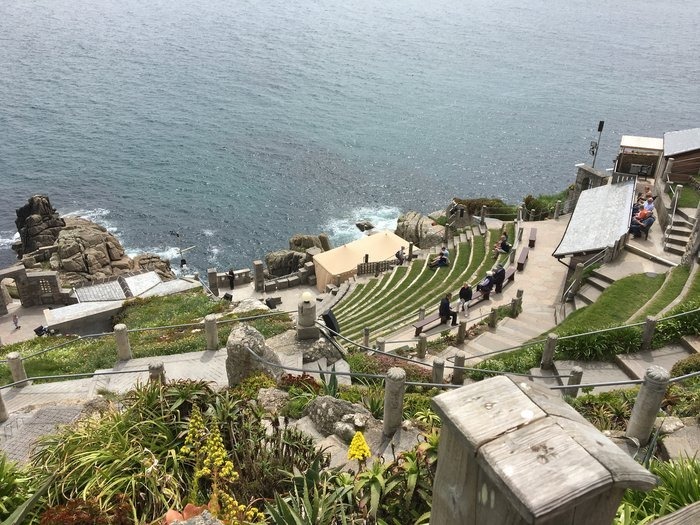 While the Minack Theatre is very much a working theatre and plays take place throughout the year, the history of how it came to be is incredibly interesting. The idea for the theatre came about due to the local dramatic society putting on a play, Midsummer Nights Dream, nearby in 1929. When they were looking for another location for their next play, a lady called Rowena Cade, who lived in Minack House, thought that the cliffs nearby her house would be perfect. She set about, alongside her gardener, transforming the cliffside into the spectacle that you see today. She started building in 1931 and the first play was performed in 1932. On that day the spectators sat on deckchairs or the grass surrounding the stage rather than the concrete seating that is there now, but it was just the start of something amazing. The theatre has improved over the years with the terraced seating being added and of course, there’s the current shop, cafe and exhibition centre nowadays, but the vision she had in the early days can still be clearly seen. Some interesting things to note are the names of some of the plays that have been performed at the theatre along with the dates. 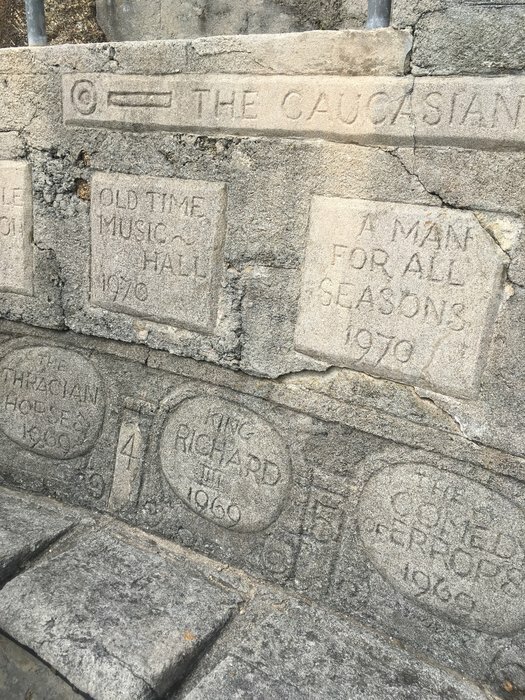 These have been carved into the seats as the concrete was drying. During the second world war, not long after the first plays were performed, the theatre was off limits. Cornwall was at risk of invasion and so the coastline, including the theatre was covered in barbed wire, pill boxes and defenses. What I really loved about the history of the theatre was the fact that it felt it was built out of a love for the performances. Rowena Cade and her gardener pretty much built it by hand and there are so many pictures of her doing it. 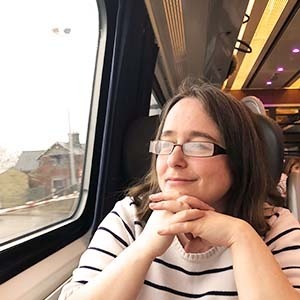 I loved the connection with her and the fact that it was such a small scale endeavour with such lasting effects. 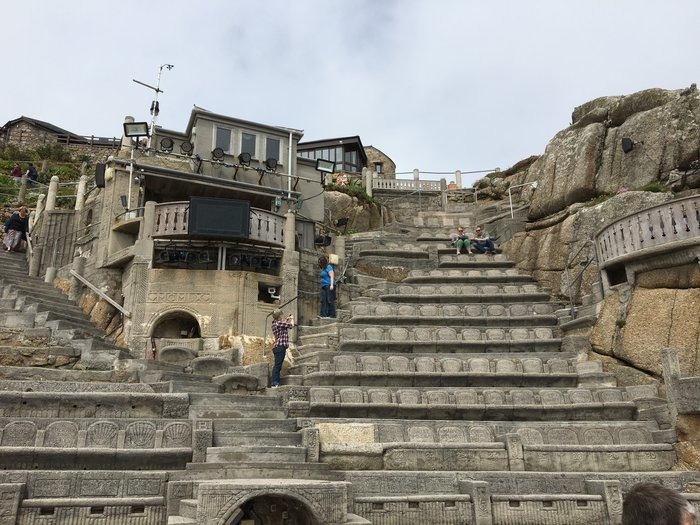 The great thing about the Minack Theatre in Cornwall is that you don’t just need to watch a play there to enjoy the place. You can visit and look around on any day throughout the year (when there isn’t a performance – see below) or you can come when there’s a performance on and enjoy the spectacular sea view and a play combined! If you’re coming to just look around there’s a really interesting exhibition that shows how the theatre was built and the history of the place with lots of pictures. You can look around, soak up the gorgeous view and imagine what it would be like to enjoy that view while being entertained by a play or a concert! Perhaps you’ll be inspired to revisit and take in one of the events too. The gardens are really nice to wander around too – it’s just a really pleasant place to visit. 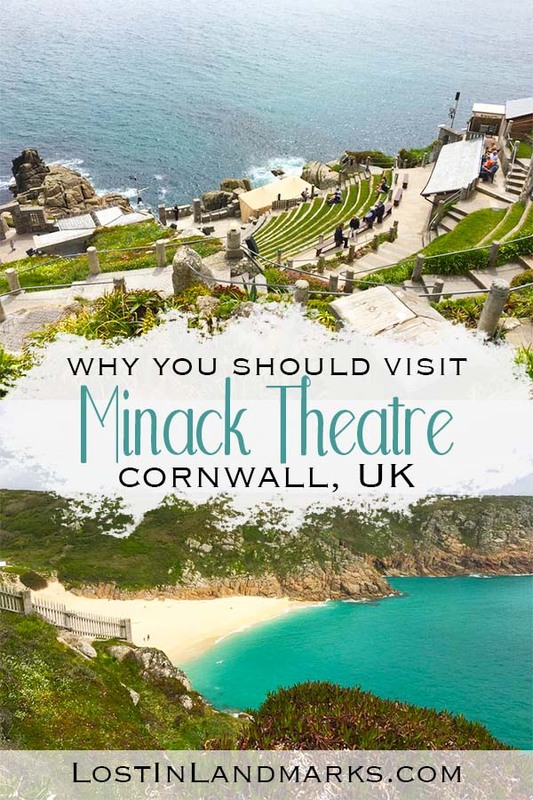 One nice thing about visiting is it’s also dog-friendly (not during performances or their storytelling sessions though) so if you’re on holiday with your dog and looking for something to do then Minack Theatre definitely fits the bill. There’s a cafe and a visitors shop to enjoy as well, again with that stunning view! 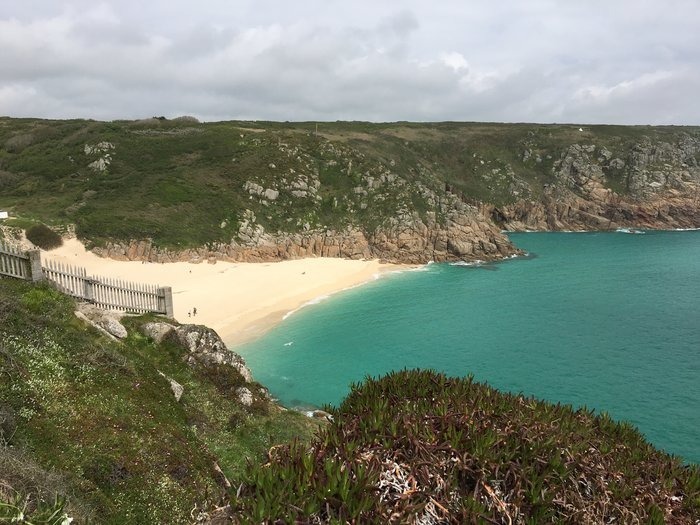 While you’re nearby I recommend taking a walk down to Porthcurno cove which is a beautiful little beach down from the theatre and a great place to take a picnic or allow kids to let off some steam. Do be aware that it’s a fairly steep climb back up and if you’re at all like me (i.e. not in the best shape!) you might be a bit out of breath walking back up to the car park at the theatre! Visiting St Ives while in Cornwall? 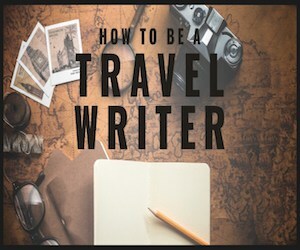 – Here’s our guide on 12 things to do there. We found that it was fairly inexpensive to visit the theatre in the day with tickets being £5 per adult and £2.50 per child (correct as at February 2019). NOTE: when there is a matinee performance on the last entry to the theatre is from 11.30am. Do check on their site before going to see if there are any events on that might restrict visiting times. Cornwall is in the South West of England, about 300 miles from London. Minack Theatre is in the village of Porthcurno at the southern tip of the county. The best way to arrive is by car and there’s plenty of car parking spaces should you need them. The roads around this area of Cornwall can be very narrow though, so do take your time. It’s recommended if you have a larger vehicle or are nervous about travelling the roads, to take the A30 road almost all the way to Lands End and then follow the signs to Porthcurno and the theatre otherwise your sat nav may take you through some smaller villages with small lanes. You can get a bus from both Penzance and Lands End (A1 Kernow First) which stops in Porthcurno and is about a 10-minute walk from the theatre. Taxis should also be around and available if you’re staying nearby and don’t have your own transport. Penzance Taxis is one company that should be able to help you out.